Upload and change a config file or just selected lines, change a banner or access lists, and improve configuration compliance. Connect to a network device to load initial network configuration, IOS files, and transfer configuration file updates using TFTP and SFTP/SCP. Set up NetFlow data export on a Cisco device to start monitoring bandwidth. Be able to see exactly how your bandwidth is being used and by whom. Config Compare, a part of ETS, is built to compare the running configuration of a Cisco router with the startup configuration. With the Cisco configuration compare tool, you can easily detect the changes made to the network, switch, and router configurations that are not committed to non-volatile memory (NVRAM). It’s good practice to compare running and startup device configurations before rebooting a router. ETS also includes network switch and router configuration management tools to view and edit Cisco config files. With SFTP & SCP Server and TFTP Server, you can easily push OS images, firmware, and manage configuration updates, backup configuration files, and transfer files up to 4GB. Multi-threaded for fast performance, concurrent transfers from multiple devices enable you to transfer files in an encrypted manner. 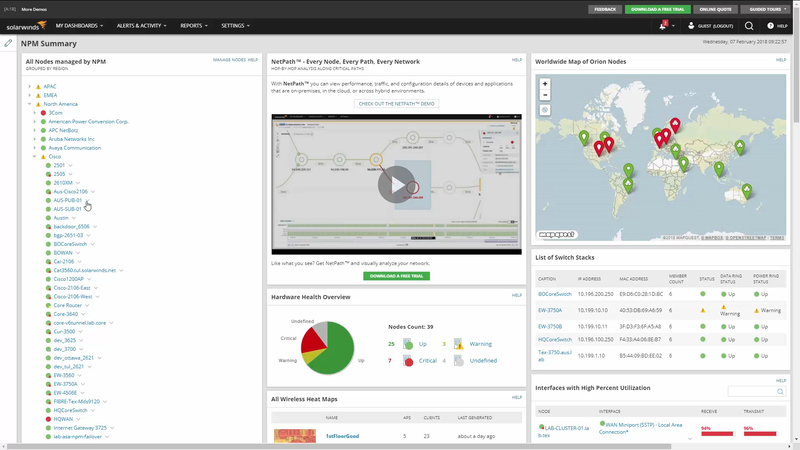 The SolarWinds® NetFlow Configurator provides a simple, wizard-driven tool to remotely configure your NetFlow-capable Cisco routers. The Cisco NetFlow configuration uses SNMP to change the running config of a NetFlow‑capable device. In conjunction with the NetFlow Realtime tool, you'll be able to see the last 5 to 60 minutes of flow data broken out by applications, conversation, domains, endpoints, and protocols. You can use NetFlow Realtime to explore exactly how your bandwidth is being used and by whom. Access essential network and device configuration management tools to help you stay on top of config changes. Increased troubleshooting time and difficulty tracking configuration changes can impact network performance. Numerous network devices need a TFTP server to load initial configuration, IOS files, and transfer config file updates. Adherence to security policies is critical to prevent outages and incidents. Network configuration management tools are utilities that can simplify creating, editing, backing up, and connecting to network devices, like Cisco routers and switches.